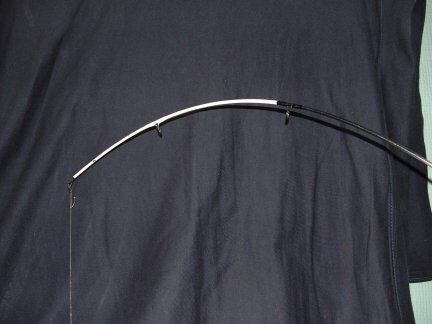 The blank is a specifically designed flood and feeder rod. The blank is 11 foot 9 inch and finished in clear smooth lacquer. The blank has 9 inches of "soft" graphite incorporated into the tip for "shock absorbency" and bite detection. The remainder of the blank is made from a blend of High and Intermediate Modulus Graphite with carefully designed tapers and wall thickness for optimum power without the inherent poker like feel of some so called flood and snag rods. However, the rod is more than happy to cope with casting weights in excess of 8 ounces. 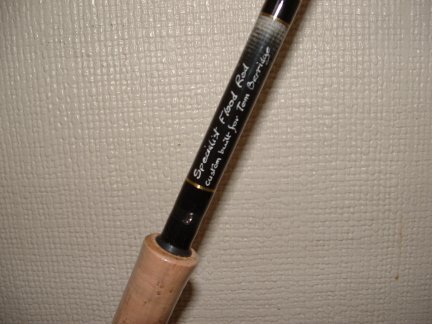 As standard the rod is supplied with a full cork handle of 23 inches with a Fuji DPS reel seat. A hook keeper is fitted as standard. Usually tied in black thread with a hint of gold. As always, Peregrine can usually incorporate small changes to customer requirements. As most people know the majority of my fishing is done on the River Trent and after struggling in the winter floods to catch a fish or even be able to fish, I talked with Roger and Chris Ponsford (Whom did the development work on the rod) I decided to purchase 2 of these rods. The 1st time out was at the Barbel Society water at Sutton on Trent, now this is a "BIG" water by no stretch of the imagination, 100yds+ wide in places and a tide rise and fall of up to 10ft+ and flood water levels of 15ft+, lots of rocky banks and only 2 trees on the whole 2mile stretch! So none of your 2 Swan Shot rigs here, it is 2oz min on a quiet day and up to 8o zs+ when the tide is running! I decided to fish on the "Beach" and any regulars who know, it was the 2 trees peg, here it is a "long" cast to get to the barbel as they reside under the trees. The rods are now coupled with "OKUMA" epix pro 60 baitrunners with the inevitable 20lb "Power Pro", 5oz method feeder and pellet hook baits. Not wanting to "break" the rod with the 1st "chuck" it went a little short by about 20 yds but I left it out as I rigged up the 2nd rod. The cast flew out and as I had given it a bit "more" it landed perfectly!…………15yds past the trees on the opposite bank! After pulling it back into the river I fished on. The next cast, after loading the method feeder, I decided to weigh the whole rig it was just short of 9ozs!! No fish that particular day but after my 1st winters fishing with them on a flooded Trent and catching my first floodwater barbel - with fish caught to just short of double figures, I can say they are truly remarkable rods, loads of power when you need it to cast but very forgiving when playing fish, the through action of the rod and the bite detection are 2nd to none. I have used them for "normal" fishing and find in a "hit" and "hold" situation they have no equal. In this photo the tip has 11ozs pressure on it - you can see the softness in it. They really do come into there own on a flooded river casting "upstream" with lots of debris coming down, the soft tip will take up the pressure as the leaves build up and not rip the lead out as most rods do. Less lead is needed to hold in theses circumstances so more comfortable fishing and more time-spent fishing mean more fish on the bank. The field-testing that Chris and Roger have done and the excellent development that Harrison did on the original blank has resulted in what must be the top "Specialist Floodwater Rod" on the market. As an aside at the Barbel Society Conference 2004 "Peregrine" had a stand there, BFW stalwart and tackle reviewer Paul Thompson ("tommo" who is know for his uncanny ability to break any rod ever made), tried 1 out and could not believe the amount of pressure you could put on the rod, he "bottled" out before me and I was holding the other end of the rod. Price £185 Dependant on custom finish.